Three guesses as to which brand's "Youngest Pinup Encourages Teens to 'Go All the Way'"? 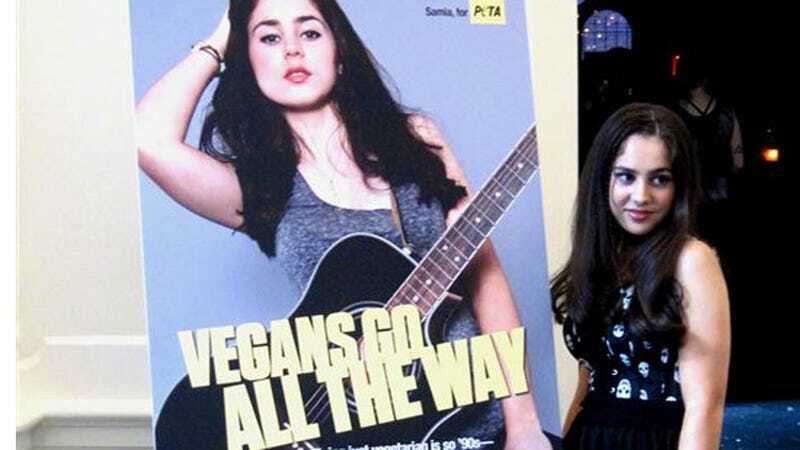 PETA means being a “vegan” as opposed to just a “vegetarian," of course. Or does it?!?! Double entendres are so shockingly hip. The "playful posters aimed at teens" will be released along with with sixteen-year-old singer-songwriter Samia Najimy Finnerty's (mom is Kathy!) solo concerts. Next up: tweens give BJs in exchange for Vegenaise.